This is truly one of my favorite days of the month. It’s new meal plan day!! Call me a nerd, but it’s always exciting to have a new meal plan, ready for the month ahead. To think of the time it frees up, the stress it eliminates, being able to check off all the boxes from my fridge and freezer inventory?! Have I confessed my love for checking boxes? It’ll be the demise of me for sure, lol. We’re knee deep in winter months so we’re enjoying the bounty of the season with produce like squash, hearty greens, apples and pears. There’s meals that will warm you cold toes (like classic chili and enchiladas) and seasonal salads that will carry you through to spring. Most importantly, there’s plenty of frugal meals strewn throughout so you can eat well without going broke! This meal plan is for the average family of four, costing approximately $330. You might need to change portion sizes according to your own family size and budget. Meals are based around 2 whole chickens, 2 1/2 lbs pork roast, 2lbs bacon, 1lb ground beef and ham shanks. The meals within this plan were designed to build off of each other, using leftovers when possible and allowing opportunities for batch cooking (i.e. making one big batch of tortillas instead of making “just enough” on two separate days.) Take advantage of this to really lower your budget and reduce time spent in the kitchen. Breakfasts are usually a variety of meals, based largely on what we have in the kitchen and almost always served with fresh fruit. These are a few basic meal ideas, plus some recommended recipes that should align with the ingredients being purchased for the dinners above. Simple meals like breakfast porridge and baked oatmeal can be flavored based on what you have in your own kitchen. Similar to breakfast, lunches are usually a variety of meals based on what’s in the fridge and pantry and come with a side of fresh fruit. My first suggestion for lunch is always leftovers (unless the leftovers are already slated for another meal), but here are a few additional lunch ideas that are simple and easy to prepare. As a bonus, all of them can be tailored according to what you currently have on hand, and packed either for school or a picnic lunch on the go. Since the goal is to not consume too much sugar, let’s keep the options minimal. Still, you’ll be able to enjoy delicious fall flavors in either one of these treats. 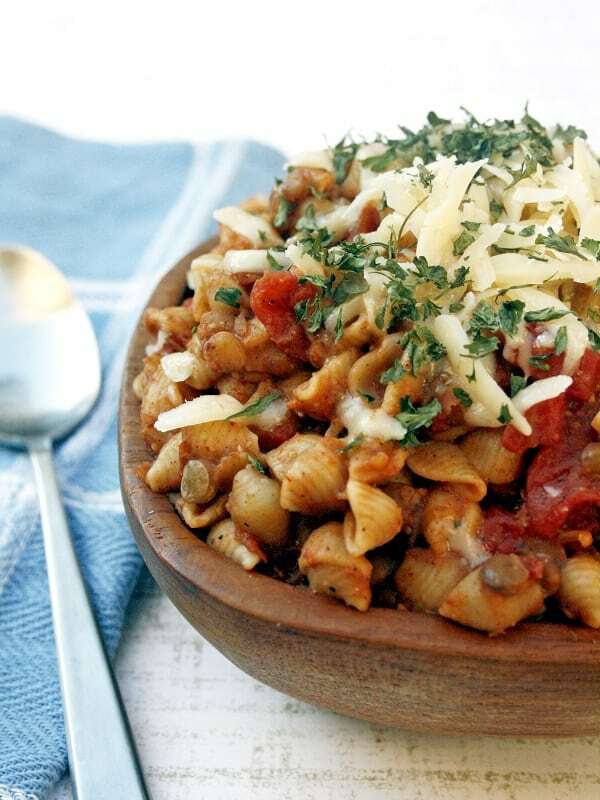 Looking for more delicious and frugal inspiration? Get more real food meal plans here. What’s on your whole foods meal plan this month? Can I just say a huge thank you? (I’ve never commented before, but I’ve been reading for a while!) 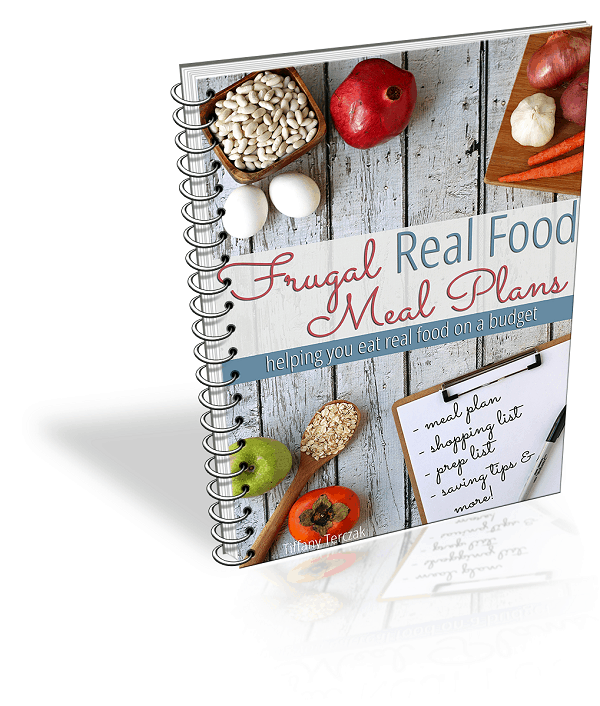 I’m so pumped about your new Frugal Meal Planning subscription service, but with our two-person household and extremely meager budget, it’s something that my husband and I are working to fit in our budget, but sadly can’t do right now. I was so sad to miss out on your meal plans, as I didn’t think you’d still be posting your monthly plan in this form! I know the subscription service will eventually give me 1000x more options and help, but I’m so grateful that you’re still posting these for us!! Aw Brittani! Thank you for leaving this note! I know that the meal plan membership isn’t for every family, and we want to continue sharing the 4-week menu for those who struggle with meal planning but don’t have the option of the membership. I’m so glad you’re able to use the meal plan to best fit your family!! YOU are a blessing to ME Brittani – thank you for supporting Crumbs!! I just want to echo Brittani! I think the meal plan service is amazing, but there’s just not wiggle room for it at the moment. 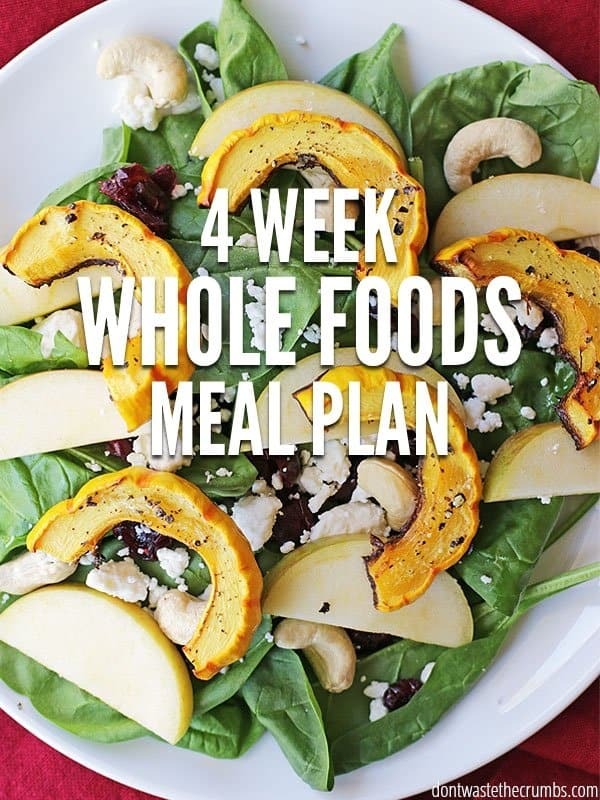 I have been using these four-week meal plans for the majority of our meal planning in recent months and have loved them. I’m so relieved they’ll still be here! I’m hoping that there can be some room in the budget for the service before long, as I know they would simplify my life a lot. (I’m a homeschooling mama with one in kindergarten, and three under school age, so I can use all the help I can get!) Thank you for continuing to post these. I can’t tell you the relief when I jumped onto the site to poke around some more and found them posted here! The first recipe link takes me to pulled pork, not Mexican carnitas. Is there another place to find this recipe? Oh….I guess I didn’t know what Mexican carnitas were. 🙂 Oops! Thank you. 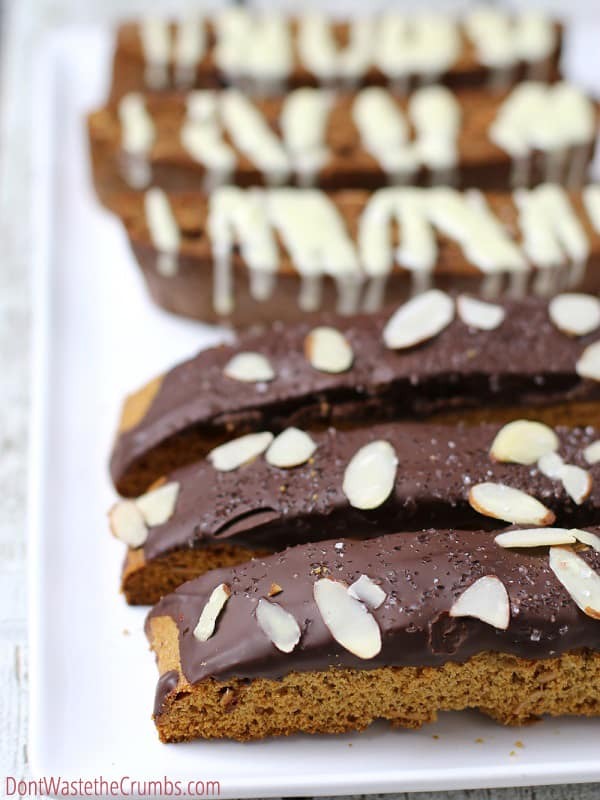 Having trouble with the biscotti link. Great menu for this month! Thanks for sharing! Fixing that now Jenna – thanks for the correction and compliment!! It should be fixed Jenna! PS – I second your second as well! This is amazing!! I bought the subscription to the meal plan. I was a little leery about how my husband was going take his menu. But so far it has been a huge success!! He has certainly questioned quite a few of the dishes while they were being cooked but has enjoyed everything so far! =) He’s worse than our kids for being picky about what he eats, and whines more about it too when I try to eat cleaner and cheaper. So thank you, thank you, thank you!!! I love not really having to find recipes or plan, I love just the simplicity of following your plan with everything else I have on my to-do list day to day. I know what you mean, Tamara! I’ve only run into 2 recipes in over 2 weeks that someone in my family didn’t like; however, my kids have learned they can eat anything once. Lol! Also, my husband typically hates leftovers but since the recipes are so yummy, he doesn’t mind at all anymore. And Tiffany, I’ve changed up some things so easily, to fit our time and family. Since I didn’t buy the Meal Plan until the 5th, I missed the yummy cole slaw. So instead, I made it the day of the Asian Pork Tacos and we put both in the wrap! We also went through a double recipe of the Ginger Marmalade dressing because it was a huge hit! 2 recipes over 2 weeks is a pretty good track record Stacy! And the fact that your husband now eats leftovers is a feat in and of itself!! I’m really, so impressed that you’ve been able to use this meal plan to fit your needs, despite how diversified they are! What a great way to think outside the box! The meal plan helps in terms of cooking less often and re-using what you’ve already cooked more, but does not include big batch cooking sessions. A common example would be making a triple batch of rice on one day, and then reserving two portions for future meals. Or making a massive pot of beans one week, and setting aside portions for future dinners. I try to include doubling/tripling into the plan as often as possible without making it too time intensive in the kitchen every night. I hope this helps Allison!